Are you switching over from traditional phone lines to a VoIP communications system? 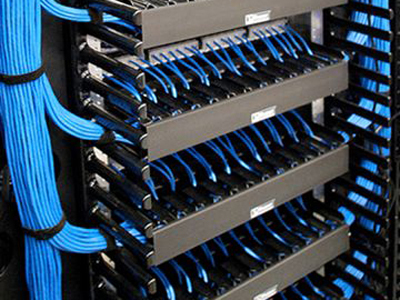 Are you trying to improve the quality of your internal cabling? Dome Technologies not only supplies the equipment, but also the services, such as structured wiring, to bring your business communication capabilities up to date so you can take advantage of the latest technology in the communications industry. Today, Category 6 cable (CAT 6), is the industry standard for Ethernet connectivity. The more stringent specifications mean less cross talk and noise interference for the user. Cat 6 cabling is suitable for 10BASE-T, 100BASE-TX, 1000BASET-T, 1000BASE-TX, and 10GBASE-T connections for speeds up to 250MHz. If improved performance is needed, you can upgrade to Cat 6a, which provides performance up to 500 MHz. Choosing between fiber optic and coaxial cable is often decided by the needs of the business. For instance, if a company is using higher bandwidths and the lines will not be bent or kinked, fiber optic may be the better solution. However, if cable will be running long distances throughout the business, including around corners and equipment, coaxial cable may be more prudent because of its durability. Your specific needs should be discussed with one of our representatives to make the best decision. If your business relies on communications, your structured wiring is just as important as the product on the shelves or the services you offer. Dome Technologies is one of the leading service providers and will work with you to make sure your wiring and cabling structure delivers exactly what you need and expect from your communications systems. Choosing the right cable is important, but so is laying out the proper IT road map for your structure. Our skilled technicians provide a mapping solution that will provide you with ease of both setup and maintenance. You can now upgrade your communications system to improve performance, productivity, and customer service while saving money now and in the future. Dome Industries are an authorized reseller of Polycom, offering you the best VOIP phones in market. We offer 25 Year to Lifetime Warranties on our cabling projects. So stay worry free! Maintenance and Warranty Contracts Available on all PBX and electrical locations. Copyright 2014 - DOME Technologies. A design by Mindsaw web design.